Don Philip Rupasinghe Gunawardena, whose death anniversary falls on the 26 March, was one of the most fiery Marxists that ever lived in Sri Lanka .He shone in the political field as a Trade Unionist, a State Councilor and a Parliamentarian. Born on 11 January 1901, he was one of the eight children of the well-known Boralugoda Appuhamy, Don Jacolis Rupasinghe Gunawardena and Dona Liyanora Gunasekara. Philip was the fourth child in the family. Philip Gunawardena commenced his primary education from a village school in Avissawella. subsequently he became an old boy of many an alma mater such as Prince of Wales College, Moratuwa, Ananda College, Colombo, Trinity College, Kandy and University of Colombo. At the age of 21 providence cleared his path to access higher seats of learning in foreign lands. Initially he gained admission to the University of Illinois in the USA to read Economics and at the University of Wisconsin. Finally he passed out from the Colombia University in New York with a doctorate in agricultural economics. Philip Gunawardena returned to Sri Lanka and became actively involved in the Suriya Mal Movement which had been formed to assist the poor during the Malaria epidemic in the early 1930s. He was the founder of the LSSP in 1935, and led the Suriya Mal Campaign in 1934-1935 together with other LSSPers like Dr. N.M.Perera, Colvin R. de Silva, Leslie Gunawardena, Robert Gunawardena (brother of Philip) and many others. In 1939 Philip Gunawardena married Kusuma Gunawardena, who entered politics and served as Member of Parliament from 1948-1960. Philip and Kusuma Gunawardena were blessed with 5 accomplished children, Indika, Prasanna, Dinesh, Gitanjana and Lakmali who became shining stars in their irrespective fields. The LSSP broke up following the entry of the USSR into the war against Hitler's Germany and the Communists supporting the war. The Communist elements were expelled and the LSSP became a Trotskyite movement. Philip Gunawardena was so outspoken that the Colonial Government banned the LSSP and he was imprisoned together with other LSSP leaders in 1940. His brother Robert Gunawardena organised the well known Jail-break on 5 April 1942 with the help of Jailor Solomon and they all secretly left for India and were hiding. Finally they were caught and were imprisoned in India. In 1943 they were brought back to Sri Lanka and jailed for six months. Following his release from jail the LSSP split again with a section led by Colvin R de Silva leaving the LSSP on ideological grounds and joining the Bolshevik Leninist Party (BLP) of India. At the General Elections in 1947 Philip Gunawardena was elected to the first Parliament to represent Avissawella seat with a majority of 22,252 votes, but soon he was overthrown mainly due to his involvement in the General Strike in 1947, he lost his civic rights for seven years as a consequence. When the BLP group rejoined the LSSP in 1950 Philip Gunawardena left it and formed the VLSSP (Viplavakari Lanka Sama Samaja Party). 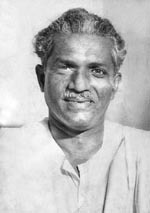 In 1951 he became the leader of the VLSSP and formed the MEP (Mahajana Eksath Peramuna). In 1956 the VLSSP joined with the SLFP led by S.W.R.D.Bandaranaike, an fomed the MEP, which won the historic 1956 general election defeating the UNP. Philip Gunawardena was elected as a member of parliament for Avissawella electorate with a significant majority. Mr. Bandaranaike appointed him as the Minister of Agriculture, Food, & Co-operatives in his new coalition government. In 1956, as the Minister of Agriculture in the new government Philip Gunawardena had the vision and the courage to implement several audacious steps to emancipate the poor masses from the shekels of poverty. He enacted the Paddy Lands Act to remove the obstacles in the way of Agricultural productivity, for he was a politician who firmly believed that rapid development of goods and services was the only way to enhance the living standards of the people. He was instrumental in establishing the Multi-Purpose Cooperatives to help the farming community. He supported the establishment of the Ceylon Transport Board by nationalizing the Bus Companies, activated the nationalization of the Harbour, establishment of the Ceylon Insurance Corporation, and The Peoples' Bank to develop the country in a systematic and wholesome way. He was also instrumental in the take over of British Air Force Base in Katunayake and Naval Base in Trincomalee to remove the last shackles of colonialism. During 1965 - 1970 Philip Gunawardena became the Minister of Industries and Fisheries in the National Government under Dudley Senanayake and was responsible for the establishment of the Industrial Development Board and gave a boost to the State Industrial Corporations and Private Sector Industries. He became the architect behind the development of the Fisheries sector. Philip Gunawardena was an eloquent speaker always armed with an overwhelming knowledge of the internal affairs of the country. He exhibited his debating skills in parliamentary affairs and managed not only to overpower his opponents' with a 'Lion's roar' inside the Sri Lanka Parliament, but ensured that he scrutinized and evaluated every legislation before any white paper went through and became Law in the Statue Book. At times he was seen helping the Speaker of the House to sustain discipline among members of the assembly during boisterous sessions. This very outright nature within him managed to earn him a reputation as Boralugoda Lion. He rejected old fashioned dogmatic ideas and armed himself with the belief that modern social development should essentially be based on scientific lines. Philip Gunawardena had one vision, to serve his mother country and, during his over four decades of political life he was able to demonstrate his ambition and successfully execute his mission selflessly, ignoring race, religion or caste barriers, but treating everyone as human beings. There was always a special lobe in his heart compacted with compassion towards the under privileged, depressed and the oppressed majority of the country. He was a human being with a magnanimous heart. He was full of enlightened thinking and a sincere devotion to his fellow beings, some superlative qualities which he left behind for modern day politicians to emulate. Today we commemorate the 36th death anniversary of Philip Gunawardena, a true patriotic son of Sri Lanka, who has gone down in the annals of Sri Lankan history as an outstanding loyalist with an innovative vision and an analytical mind, and a true representative of the people, who detested injustice and struggled to establish truth, justice and fairness always.